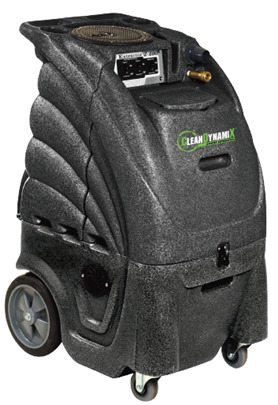 THE ULTIMATE SOLUTION IN HARD FLOOR CLEANING COMBINES EXCEPTIONAL VACUUM WITH THE POWER OF A 1200 PSI PUMP! Our Hard Surface Portable Extractor Unit is complete with one (2-stage) and one (3-stage) vacuum motors allow for 170” of water lift for efficient solution recovery that results in better extraction and faster carpet drying. High performance motors stay cool with an innovative air intake design that uses the vacuum’s own cooling fans to pull cool, outside air over the motors, reducing motor temperature and preventing overheating. This allows for performance with less maintenance. Powerful 1200 PSI adjustable pump adjusts down too 400 PSI, providing the perfect pressure for cleaning everything from tile to concrete. Complete with On-board 12-gallon solution and recovery tanks allow for quick and easy fill and dump disposal, reducing downtime. Auto fill and auto dump capability allows for constant working pressure from start to finish. Waist-high controls prevent bending and stooping to operate the machine. Adjustments can be made standing comfortably. The controls are recessed in the machine and stay protected during use, in transit or in storage. 10” non-skid, non-marking wheels make stair climbing easy and do not scuff floors. Roto-molded polyethylene tanks withstand the toughest working environments and resist dents, chips and cracks. They have a professional look with ultimate durability.